Environmental context - Description of the site: the stretch of Valley within the Park corresponds with the lower course of Torrent Cordevole which, before going down in Val Belluna and flow into the river Piave, runs between the mountain groups of Schiara and Monti del Sole (also called Canale d'Agordo). The complex of Candàten is situated at an altitude of about 420m, in a slightly more elevated position than the road; its buildings, arranged in a courtyard shape open in the east, are dominated by the rocky wall climbing towards Pala Alta, in a fascinating environmental context (a plateau covered with meadows, clashing with the surrounding harsh mountain environment, enabling the complex of the former hospice to be particularly evident). Situated at about 13 km from Belluno, it lies within the administrative borders of the Municipality of Sedico and within the perimeter of the Park. Building period: unknown (the first document confirming the existence of the building is dated 1208, year in which Pilone Nosadani sells it to the canons of Belluno). Architectural features: the nucleus of Candaten currently consists of three buildings arranged in a courtyard shape and by the small octagonal church dedicated to San Giacomo. The building, originally used to welcome wayfarers, has preserved the traditional ancient features of the rural architecture and, besides them, details of particular refinement. Great historical-architectural value. The original structure, open towards the east and the way of Cordevole, is still intact: the buildings are arranged as represented in the image found in the Land Register of Vedana (1768), with the main building oriented along the main route and the annexed church of S. Giacomo at the southernmost edge; with respect to the representation handed down to us, the only variation seems to be the quadrangular building at the entrance of the yard. The former Hospice has the characteristic features of the rural architectures of the area of Belluno: a deep wooden portico supported by brickwork pillars opens along the main façade, offering shelter to the accesses leading to the inner premises; the outside wooden staircase vertically distributes to the gallery, where the upper premises face. A particular loggia with big arches, characteristic of noble architecture, with three-pitch covering, ends the building in its southern stretch, towards the oratory. The last block is connected with the church through an upper passage, not aligned with the gallery, that was used to reach the small bell tower of the church. The small church, with an octagonal shape and simple execution, has inside traces of wall paintings representing the hospices of Val Cordevole. Former hospice, now used as a station of the National Forest Service, in a good conservation state. The history of the nucleus of Candaten is strictly linked to the history of the Hospices situated at the edges of the itinerary leading to Agordo. During the Middle Ages, the hospitales were widespread: they were specific structures, usually founded or approved by the Bishop, with both a religious and welfare function, according to the principles of Christianity. At that time, the locality was an important lap along the route running along Cordevole towards San Pellegrino Pass; it was a very difficult route, to the extent that in the stretch from Peron to Muda there were three welcome structures: the complex of Vedana, on which the shelters of S.Giacomo di Candaten (probably more recent than the others) and S.Bartolomeo d'Agre depended. Without a doubt, the main hospice was the hospice of Vedana; already around the year 1000 there are documents witnessing that these lands belonged to the Chapter of the Canons of Belluno. The structure was entrusted to lay brothers living in community and led by a superior with the assistance of a religious man. The hospices had precise moral obligations towards the wayfarer, regulated by special statutes; however, the lack of a strong religious root negatively affected these structures which soon decayed. In a last attempt to recover the minor hospices, they were temporarily absorbed by the hospice of Vedana: the solution was not successful, to the extent that in the first half of the 15th century the confraternity broke up and only the prior remained. 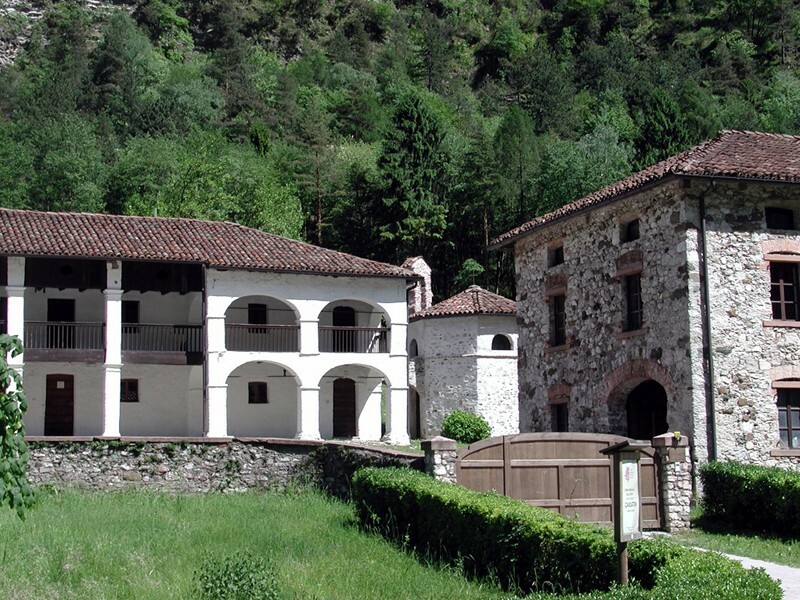 The thematic itinerary of the Park called The Route of the Hospices has been recently created: it leaves from the Charterhouse and reaches Valle Imperina; this interesting itinerary gives the opportunity to better discover the theme of the ancient accommodation structures for travelers built during the Middle Ages along the main route of Val Cordevole, one of the most important north-south routes of this section of the Alps. Directions and information panels along the itinerary and at the main "laps".